During the final week of June 2010 and the opening of July, the body count of veteran teachers who were being dumped from their jobs in Chicago — usually after decades, repeat DECADES — of service to the children of Chicago's public schools kept rising. In addition to the displaced mentor teachers Huberman fired abruptly (they were completely out of work, without reserve status, July 1), there were the citywide teachers, social workers and others, and the "displaced" teachers whose year-long reserve teacher status had run out. 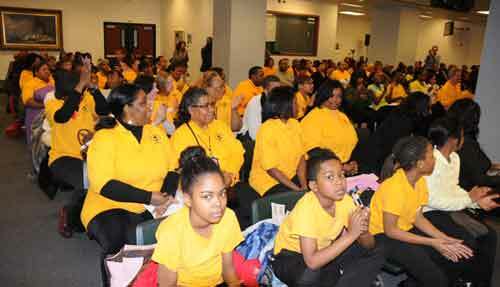 More than 200 teachers, students, parents, and community supporters turned out on the night of February 10, 2010, to protest the planned "turnaround" of Chicago's Bradwell Elementary Schools. Among those supporting Bradwell was Alderman Sandi Jackson, wife of Congressman Jesse Jackson Jr. Despite the eloquent refutations of every point made by Ron Huberman's staff that Bradwell was a "failing" schools, CPS approved the "turnaround" of Bradwell, and more than 100 of the school's staff, including teachers, were dumped following the end of school in June 2010. The teachers and others from this year's crop of "turnaround" hypocrisies join those displaced in previous years under the policies that target the poor, rather than the poverty which is created by the USA. Teachers have become the scapegoats for the Obama and Daley administration's policies. Substance photo by George N. Schmidt.Yet to read the ruling class's corporate media, you would think the biggest problem with teachers in Chicago is a handful of "bad teachers" (who should be fired without due process) and the fact that some very very very young teachers do not have jobs now. For the past seven years, beginning with Arne Duncan's "renaissance" in 2002 and growing with Mayor Daley's proclamation of "Renaissance 2010" in 2004, teacher bashing and union busting have been the agenda for corporate Chicago and their mouthpieces, the "reporters" for Chicago's corporate media. Readers who believe what they read as news in the Chicago Tribune, Chicago Defender, and Chicago Sun-Times are ingesting a steady diet of corporate propaganda, packages by reporters as so-called "news." This year the avalanche of propaganda has reached its apex (or, perhaps more accurately, nadir). While thousands of teachers and other dedicated schools staffs are being ruthlessly eliminated from their jobs, the corporate media echoes ruling class talking points and promotes four things: the supposed "loss" of young teachers (who are this year by definition better than all other teachers, despite all evidence to the contrary), the superiority of charter schools over real public schools (despite the evidence, both in Chicago and elsewhere), the need to get rid of "bad teachers" (despite the fact that few veteran teachers are bad teachers, and the statistical fact that if you focus on test scores, those who teach the children of poverty are going to be "bad"), and the promotion of incompetent, overpaid patronage hacks into leadership positions over veteran public schools educators (the Huberman administration has given more power to people with MBAs and "CTAs" — experience with the Chicago Transit Authority — than to actual educators). In any other city, this would be a joke. But corporate America has purchased the organs of corporate propaganda so completely that an alternative narrative has been drowned out, or simply ignored. Hence, when Ron Huberman fires 700 teachers from the "turnaround" schools, the attack on these teachers is relentless, while the corporate hypocrisy of the Academy for Urban School Leadership (AUSL), the main turnaround entity, is mindlessly promoted.